Matt Seamons and Jana Sardoni, BYU electrical engineering majors, demonstrate the devices they built that transmit music from an iPhone to speakers using a laser. Use light to transmit music across a room  thats the challenge for students in a BYU electrical engineering class. Each semester, classes resume the challenge of improving on previous designs. At one point, their device had to be plugged into an outlet to work, then the students figured out how to make it battery powered. This semester, the students made it compatible with any music player. 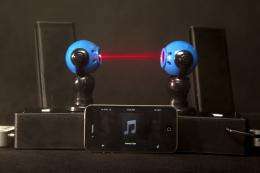 The current model, known as free space optical transmission device, can beam Party Rock Anthem or any song from anyones iPod to a receiver and speakers up to 20 feet away. Its battery life is more than two hours. Seeing everything come together at the end, working even better than we expected, was really cool, said senior electrical engineering major Jana Sardoni, who has already accepted a job offer from Intel to design processors. Sardonis team produced the winning design. Their device ran the longest without recharging and also added an LED display that indicated battery life. The students built a transmitter, which plugs into an audio device, and a receiver, which plugs into speakers. The transmitter directs a laser to flash in a distinct pattern. They also created a circuit that can compute the flashes of light and translate them into a recognizable format for the speakers. Greg Loveland and Raymond Barrier were also on the winning team. How is this news? I did it as a 14 year old in 1954, and it was battery powered. Used vacuum tubes, but I couldn't get more that a hour out of the batteries. Gave it up when my allowance was exhausted. True, it is old tech, but this article highlights a teaching method that stresses heuristics, imo.
" If you can't find a solution, try assuming that you have a solution and seeing what you can derive from that ("working backward") "
" Heres how it is supposed to work, to these specifications. You go find your own solutions.